Bruce Goff’s Chicago | ride. travel. live. Bruce Goff was one prodigious fellow, with a very long career and a wholly original style that could be seen as a deeply personal interpretation of the Prairie School. He spent part of his career in Chicago, and there’s a memorial for him in Graceland Cemetery. 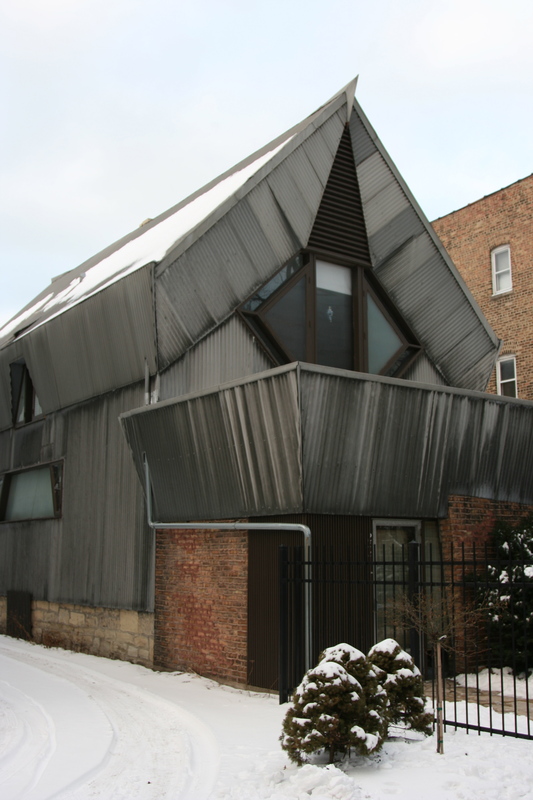 He also designed two houses in Chicago, one a radical remodeling of a 19th century structure, the other a rather unusual not-quite-mid-century Modern house on the fringes of the city. Here’s my little tour of the two structures, on a frigid winter day in the city. 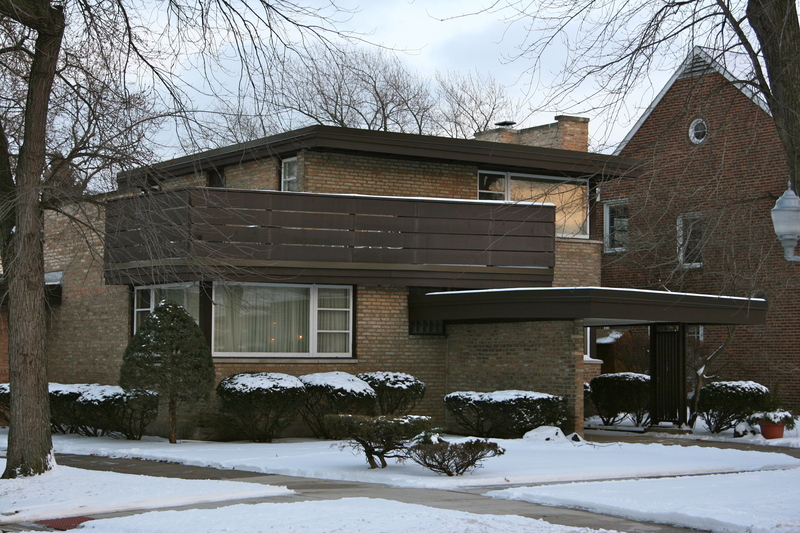 The Bachman House is a remodeling, completed in 1948, where Goff took a 19th century house, gutted it, and replaced it with a Space Age, corrugated metal facade. He also redid the brick in a style reminiscent of the tail fin on cars of the 1950s, flaring out, with an asymmetric brick front. How about that? 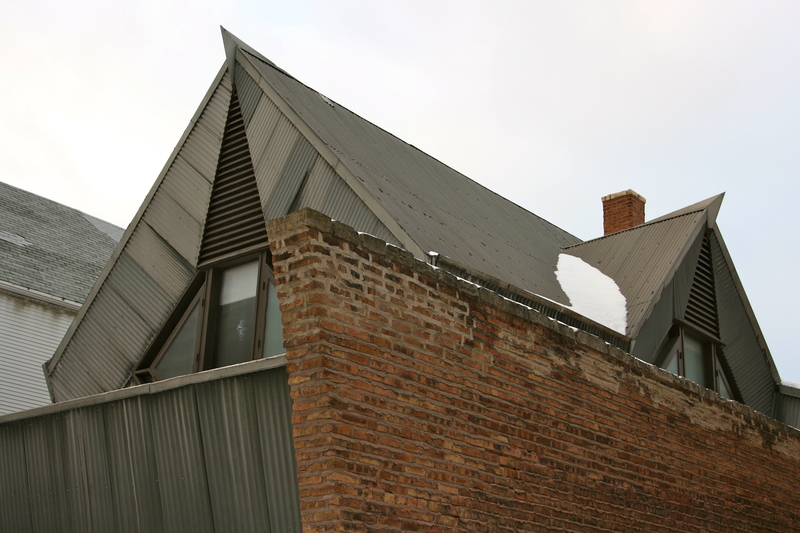 Despite this rather wild facade, Goff’s house designs were also known for being practical and livable. Way further afield, in the far northwest corner of Chicago, is the Turzak House from 1938, which resembles a distant Prairie School relative, enhanced with more asymmetry and all sorts of fun touches. It’s got an entry with brick on one side and wood or metal on the other. The canopy is sloped, and so is the railing on the balcony, which fools the viewer’s perspective. There’s definitely more than meets the eye in these houses. His stuff in Oklahoma is way out there, figuratively speaking, and I’ll have to check them out someday.